Samuel here. I bought a caricature from you a couple of years back. Please see below. ....As for the look and feel of the caricature, I was doing abit more thinking – ok I think we can keep to one building, i.e. White House. I’m picturing my colleague standing in front of the White House. So the White House is in the background, and she is standing on the White House garden. 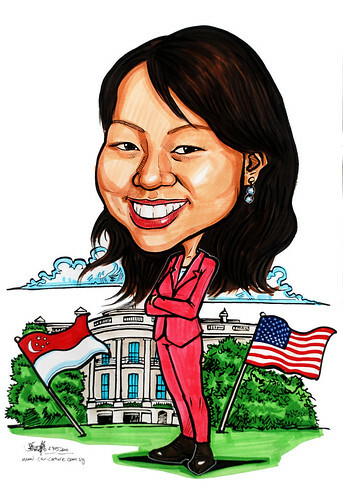 Was hoping to have 2 fluttering flags – US and Singapore on the caricature too. Can either be drawn in the sky or as flag poles on the White House garden where she is standing."